Here is a light little cake that you can whip up very quickly with Bob’s Red Mill Vanilla Cake Mix and a few other ingredients. 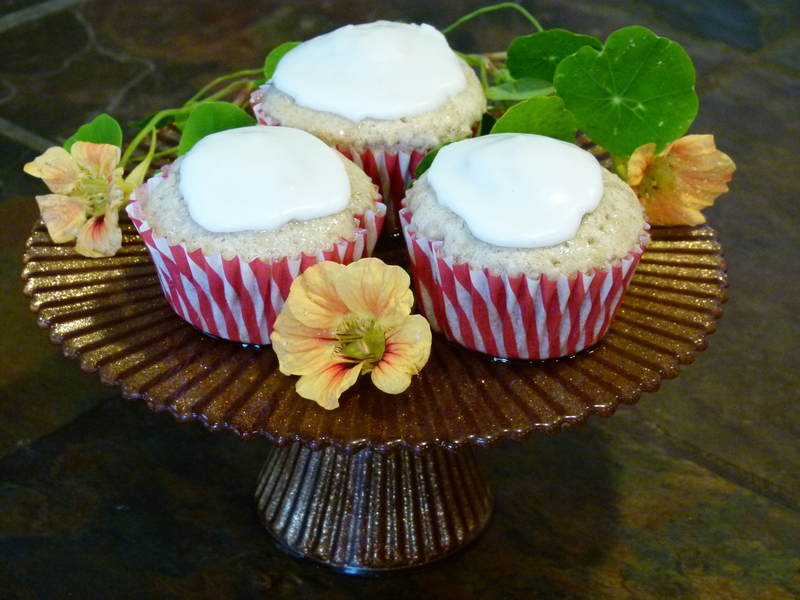 This recipe calls for a simple lemon syrup to be poured over the warm cake, so if you make cupcakes, you will need non-stick cupcake baking pans. Don’t use papers, the syrup will saturate them, making more mess than you will want to deal with. Stir ingredients in a large bowl with a mixing spoon until completely mixed. Pour into a non-stick 8 x 10 inch pan or cupcake pan. Bake at 325 degrees for 25-30 minutes (or 20 minutes for cupcakes) or until the cake springs back when pressed lightly in the center. Meanwhile, while your cake is baking, make your syrup. Cook the juice and sugar on medium high in a saucepan until the sugar dissolves. Remove from heat and let cool until the cake is ready. Cool your baked cake 5 minutes, then fork lightly all over and pour lemon syrup evenly across the cake. Allow the cake to cool completely. You may glaze this with either a Lemon or Vanilla Glaze. Stir together 1 cup powdered sugar and 2-3 TBSP of lemon juice until smooth. Stir together until smooth 1 cup powdered sugar, 1 tsp. vanilla extract, a pinch of salt and 2-3 TBSP of vanilla soymilk or non-dairy milk of your choice. Weekly trip to the market. Sale items: Giant cabbages, flats of very large ripe tomatoes, Washington state apples. What do all these things have in common? Well, combine them with linguine, peas and some rich truffle-infused salt, and you will know that this recipe is far better than the sum of its parts. The parts take a little effort though, so have patience and you will be rewarded! You will need to make some Truffle-dried Tomatoes and some Braised Cabbage with Washington Apples and Onions. 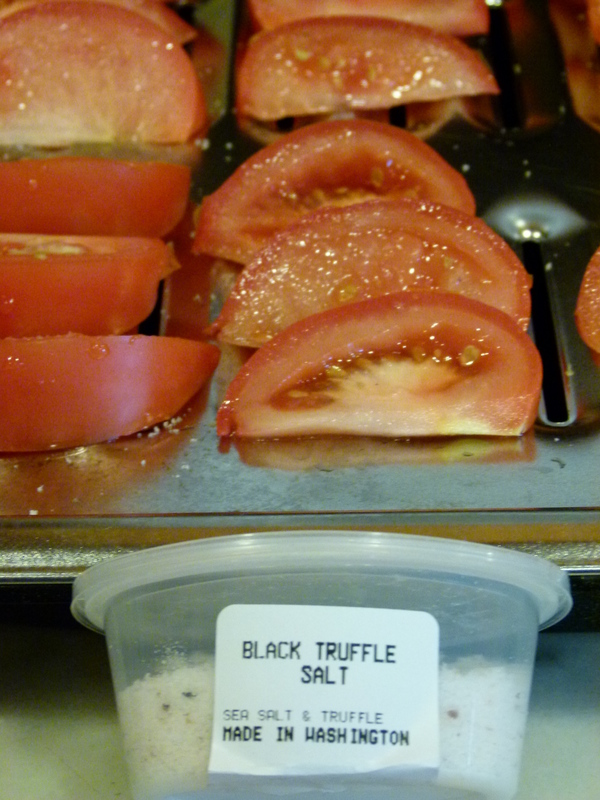 Truffle salt imparts a very subtle richness to the tomatoes that really makes them special for anything they are used in. I use the salt in both the tomatoes and in the pasta water, and it truly changes the experience of this dish, so splurge if you can. If not, you can replace with regular salt and you’ll still have a tasty entrée. I’ve used a nice black truffle-infused salt that I buy in small quantities at my local Thriftway, but you can find it online at Amazon, Saltworks, and many other sources. I like to buy in small quantities for freshness and affordability, so look at your favorite specialty foods market. Once you have these parts, you can quickly assemble this entrée for a cold autumn evening. Serve with a nice glass of full-bodied red wine or pour some crisp non-alcoholic San Pellegrino Limonata in a beautiful glass and enjoy with your loved one. Bring a pot of truffle-salted water to a full boil. Cook your pasta until al dente. Add your peas during the last minute. Remove from heat and drain, reserving about one cup of the pasta water. In a large serving bowl, gently toss the pasta with the braised cabbage and dried tomatoes, adding the reserved pasta water as desired. Test your seasoning, adding more truffle salt and freshly ground pepper to taste. Garnish with toasted walnuts and parsley. I sometimes offer a small dish of crunchy textured vegetable protein to sprinkle on top with a spoon for those that want a little more protein. It adds a great crunch to the dish, but is optional. Cabbage is on sale this week for $.33/lb. I love a great autumn braise of cabbage, and because I live in the “Apple state”, and I have easy access to Walla Walla Sweet onions, I’m set. This recipe is my no-fat vegan adaptation of an old favorite recipe from Jamie Oliver’s Cook With Jamie cookbook. It is a nummy dish on its own, but is also a nice ingredient in other recipes. For example, try this Linguine with Truffle-dried Tomatoes and Braised Cabbage. Use a large soup pot, because you will have a lot of volume to start until your vegetables cook down. Turn on the stove to high and add the fennel seeds, letting them toast for 30 seconds or so. Add your broth, onions, apples and cabbage, and bring the pot to a full boil. Cover and reduce heat to low. Cook, stirring every 10 minutes or so for about 45 minutes. Add the balsamic vinegar, sweetener and season with salt and pepper to taste. Cover and continue cooking on low for another 30 minutes. Your mixture should be cooking way down to a soft delicious mash, or as Jaime Oliver says, “a gorgeously sticky-sweet cabbage dish that you’ll want to eat immediately, straight out of the pan”. You will have quite a bit of liquid in the pot, so remove the lid now and turn up the heat to let most of that liquid boil off. You’ll need to tend the pot, stirring every 5 minutes or so, until the remaining liquid has reduced to a delicious syrupy consistency. Test your seasoning again, adding more sugar or salt/pepper as needed. My final harvest of the season is always a bittersweet event. In October, I harvest seeds from all over my garden and dry them for next year’s flower beds. I snip all the remaining basil, thyme, and mint and gather the green tomatoes off the vines for bag ripening. My kitchen is strewn with plates of herbs drying in the cupboards, and bowls of seeds on the table and counters with paper scraps identifying the color and habit of this or that poesy. I clean and freeze fruit, and prepare batches of chutney and jam. It is great way to preserve the flavors of summer, but also an opportunity for reflection (remember that warm day we picked these plums?) and projection (these climbing nasturtiums might do better on that south wall next year). I’ve had some inquiries on how I dry my ripened tomatoes, so I thought I’d give you the instructions. I love to make them with specialty salts, which is an endless experiment because there are so many fantastic salts available now. You can, though, just use regular salt or none at all, and you will have intense sweet dried tomatoes to improve the flavor of almost anything you are cooking this winter. You will need an oven with a dehydrate setting or a temperature setting of 140 degrees, or you can get a counter top food dehydrator for $50.00 that will work just fine. Cut your tomatoes each into 12 wedges. Lay them on a broiler pan and set the drip pan underneath. Sprinkle each wedge very lightly with your salt. A little goes a long way, so just a pinch for each wedge. Set your oven to dehydrate or 140 degrees and dry for 12-15 hours. Store in a plastic bag in the refrigerator for up to several weeks. I find it tricky to bake with out eggs and butter. Yes, you can do it if you’ve adopted a no fat vegan lifestyle, but there is always a slightly different taste and texture to the final product. I’ve come to terms with this, but I’m still always on the lookout for new methods and products that better approximate baking done with traditional ingredients. 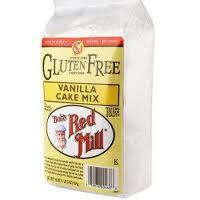 I love this cake mix. It is fast, affordable and easy to make. It is wheat and dairy free. The package calls for eggs and oil, but I very successfully substitute 1 TBSP flax meal plus 2 TBSP water for each egg and the oil. I end up with a no fat or animal vanilla cake that can be dressed up in a hundred ways. It is a real convenience food for no fat vegans! You can find this with other Bob’s Red Mill products in most markets that have a natural food section. This is a fantastic convenience food, and one that meets the no-fat vegan guidelines of Dr. Esselstyn’s Prevent and Reverse Heart Disease. Frieda’s makes several flavors, including Sun-Dried Tomato & Garlic, Garlic & Basil, Mushroom & Onion, Green Chili & Cilantro, and Traditional. You can buy this product in local supermarkets here in the Pacific Northwest, and online at Amazon. 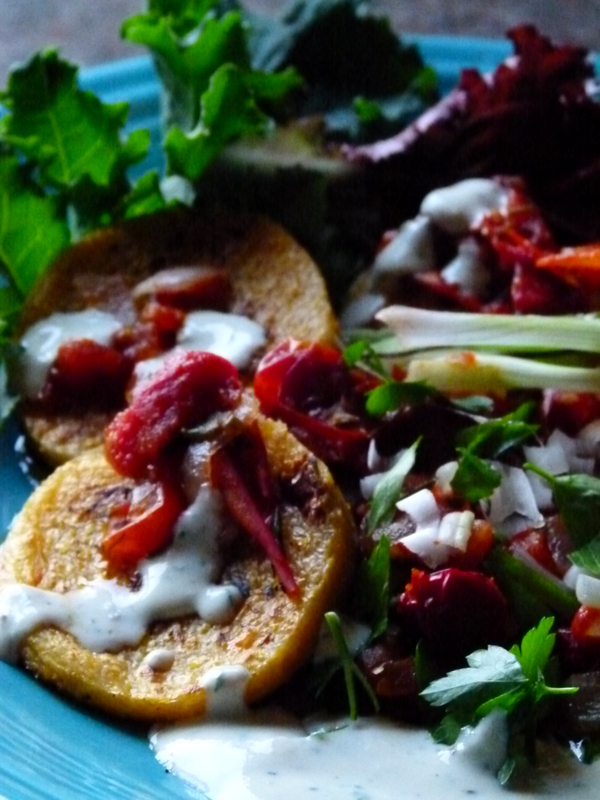 It is worth a trip to Frieda’s own website, where they’ve got a nice searchable array of interesting new recipes that can be adapted for no oil, such as their Sauteed Vegetable Polenta which I’ve adapted for this blog. In any event, this is terrific stuff, and easy, affordable and convenient. I have a wonderful friend who gifted me with a bursting bag of home-grown tomatoes every color in the rainbow. Hoping to extend the bounty over time, I dried a thick layer of these little sugar disks overnight in my dehydrator, but ironically, the outcome was so delicious, sweet, succulent, that I had to wrap them into an amazing sauce and eat them all the very next day. I discovered a great no-fat polenta; whipped up this fresh herb, sun-dried tomato ragu and garnished with a herb & garlic “creme”. 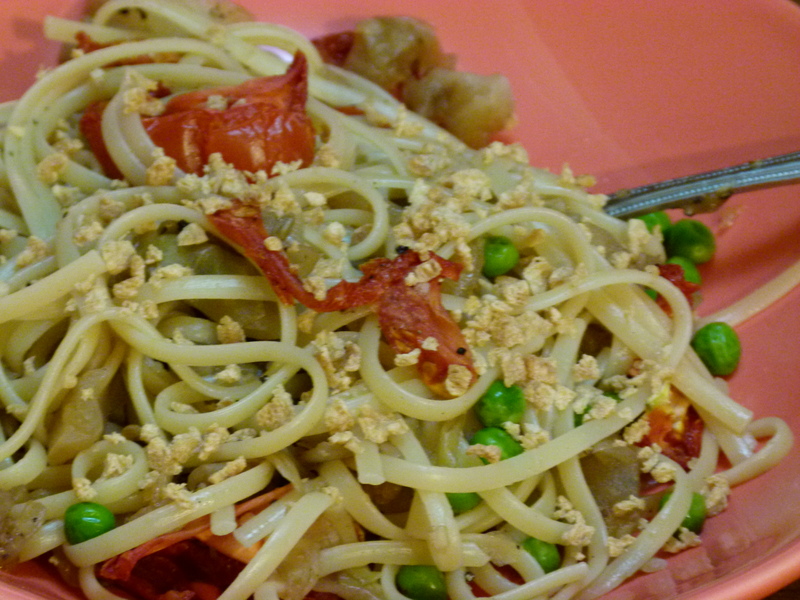 I really have to credit the amazingly sweet dried tomatoes with the huge flavor in this dish. 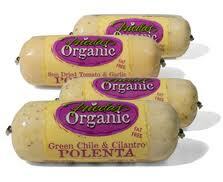 Frieda’s organic polenta is fabulous too. Try it!! Simmer the first 8 ingredients for 15 minutes over medium low heat. Slice the polenta in 1/4 inch slices and brown in a non-stick pan on medium high heat. Spoon 1/2 C sauce onto each plate. Place 4 polenta slices on the sauce and garnish with garlic cream, minced green onion and chopped cilantro or Italian parsley. Process all ingredients in your food processor until the consistency of thick cream. 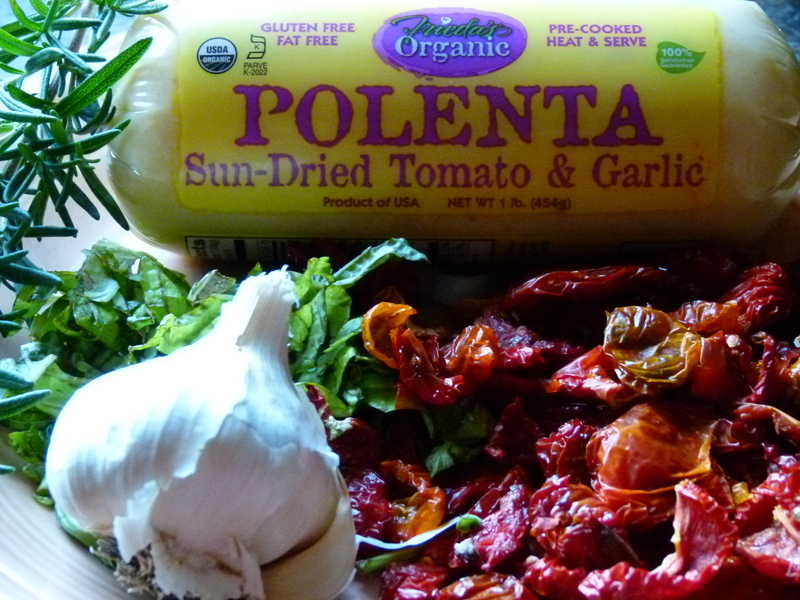 Serve with polenta. What is happening here? I'm a Seattle native who has adopted a diet of 100% no-oil plant-based nutrition. My guide? Dr. Caldwell Esselstyn's book "Prevent and Reverse Heart Disease". I've been given an alternative to the chronic illness that has plagued three generations of my family... heart disease, diabetes, stroke. This blog is my personal log of how to cook, what to eat, and where to dine out as a no-fat vegan in the Pacific Northwest.